A stunning three bedroom three bathroom new build villa for sale with Murcia Golf Properties on the Mar Menor Golf Resort. This beautiful villa is situated in a great location on the Resort, close to the sports facilities, supermarket and a short walk from the Intercontinental hotel. 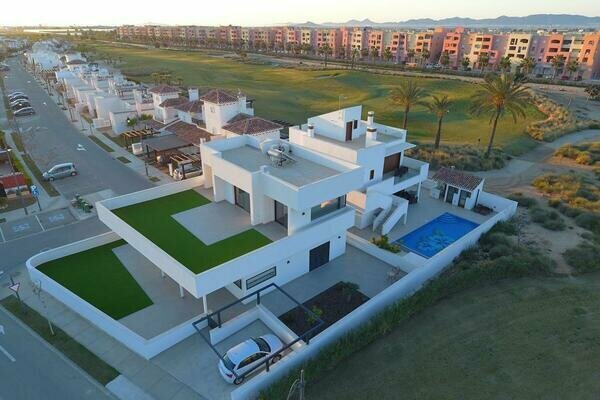 The Mar Menor Golf Resort is 20 minutes drive to the new Corvera International Airport. This beautiful villa comprises a large open plan living dining and high spec modern kitchen. Two double bedrooms and a large bathroom. Stairs lead to the second floor master suite and vast solarium, from here there is stair access to a further rooftop solarium. Viewing is essential on this villa to appreciate the high finish and great location.